Hemphill's Garden and Aquatic Center has a fastastic selection of pond supply products in stock and ready for immediate shipment. Need it today, stop by our retail center and pick it up. Come see our extraordinary collection of garden and pond accessories. Many pieces are hand sculpted by our artists. We have a wide selection of pond de-icers, fountains, lights, foggers, wall sculptures, bridges, and air pump accessories for your pond. All fish ponds benefit significantly from good aeration. 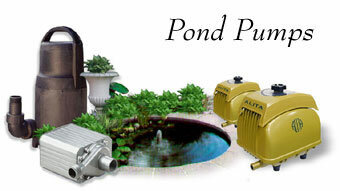 A full selection of pond air pumps by Alita, Hakko, Laguna, and Pondmaster available. Energy efficient, quiet, reliable, fountain pumps and filter pumps. Pond filter or water garden filtration systems remove waste which, in the wild, would be diluted by the large volumes of water or washed away by moving water. Filtration system types include; mechanical, biological, and chemical systems. Biological filtration systems are necessary to control algae. Create stunning dramatic light displays both in the water and out using pond lighting. Many different styles available: mini pond lights, submersible halogen lights, LED lights, egglights, automatic changing lights, halogen lights, bright white lights. Colored lenses available in red, blue, green, and yellow. Transformers included with most lighting systems. Remote controls available on some models. We also carry a variety of power control centers and replacement transformers. Our flexible rubber pond liners are weather resistant and low maintenance. They install quickly and easily, requiring no special tools or skills. High elongation properties enable the pond liner to stretch over the object. This feature is especially important after the pond is in service when earth movement, or erosion, could cause roots and rocks to be dislodged beneath the membrane, placing stress on the liner. Our pond kits include everything you need for your back yard water garden. Most kits also include the liner. If you need to move water in a pond, whether it is for a fountain, waterfall or filter, you will need a pump. We carry a large selection of pond water pumps including filter pumps, fountain pumps, and waterfall pumps. Pond skimmers greatly reduces pond maintenance and increases pond clarity. Skimmers clear surface of leaves, dust, pollen, etc. We carry skimmers designed for installation inside the pond as well as external skimmers. Compact pond skimmer and complete systems available. Installed at the bottom of the pond, pond drains encourages debris and waste to flow into a circular collection chamber, where it is carried away underground, via standard PVC pipe to a disposal area. Sump Bottom Drain and Aerating Sump Bottom Drains increase movement towards the bottom of the pond. We carry a variety of water treatment products that help you maintain a beautiful pond without the risk of destroying your plants and fish associated with pond algaecides. Ultraviolet sterilizer lights help eliminate free-floating bacteria, fungi, mold spores, viruses and protozoan (parasites) by preventing replication. They should be used in conjunction with other water treatment and filtration systems.